Pair of vintage club chairs, freshly upholstered with new down feather cushions, circa 1940s. Rare Mid-Century Ernst Schwadron club chair with walnut legs. Leather Chesterfield club chair with tufted buttons, circa mid-20th century. 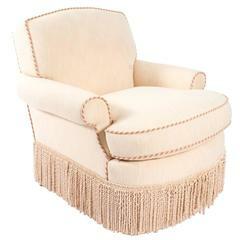 Custom upholstered English club chair in shades of pink and tan. English leather club chair with velvet cushion and oversized nailhead trim, circa 1890. Pair of comfortable 1940s club chairs. Recently upholstered in a cotton block print. Original wood legs and brass castors. Seat is 18"H. Arm is 19.25"H.
1940s Art Deco club chair with a seductive gilded carved wood frame, upholstered in a heavy silk/cotton silver fabric with a gold thread underlay. Mint restored. Pair of 1940s French club chairs with matching ottomans. Original fabric, has wooden legs and tassels. Chairs measures: 32 H x 32 W x 30 D. Ottomans: 20 H x 29 W x 16 D.
A pair of round Danish club chairs with original green velour upholstery. The chairs are in a very good condition with minor wear to the fabric. Danish large-scale 1940s club chair with channeled back upholstery.